This tour begins in Kuala Lumpur, the major city on Peninsular Malaysia, but our time was spent on Borneo, the world’s third largest island which is divided between Brunei, Malaysia and Indonesia. The island has long been a magnet for adventurers, explorers, travellers, and writers, with its mosaic of indigenous tribes and longhouses, its intriguing history of sultans and white rajas, the natural history of its rainforests, rivers, and wildlife (especially orangutans and proboscis monkeys), When InFocus Travel offered a photography tour to Borneo, it grabbed my attention. You actually have a third choice. By browsing my SE Asia galleries, you can pick and choose what country (Brunei and Malaysia for this trip) and region to look at in any order you wish! 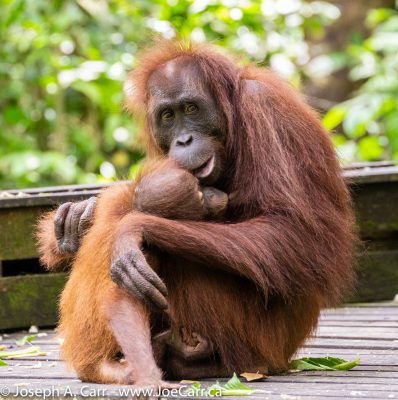 For my video highlights: Borneo Rain Forest animals & people would be the best way to see the Borneo experience. Kinabatangan Wildlife – we fly from Kota Kinabalu to Sandakan, then drive to Kinabatangan in the heart of East Sabah where all the wildlife in Borneo is waiting for us to discover – Pygmy Elephants, Orangutans, Proboscis Monkeys, exotic birds and bugs! I visited SE Asia for the first time in February of 2016 as part of a 30-day cruise based out of Singapore,. I visited five countries and observing a Total Solar Eclipse from the Malacca Strait from the ship’s deck. As it turns out, the Island of Borneo was the western shoreline I saw while watching the eclipse, however the ship did not visit the island. My previous travel experience with InFocus Travel was in 2015, when Michele Burgess led another photography tour to the United Arab Emirates and Oman on the Arabian Peninsula. I enjoyed that trip immensely, so didn’t hesitate to book Michele’s Borneo trip, since I knew it would be well-run, interesting, and cater to those of us who have a passion for photography. InFocus Tours are based in the USA, and always hub from major airports in the United States, so I flew to Los Angeles to pick up this group tour. We have good air connections down the west coast of North America between my home in Victoria either direct to California, or simple connections through either Vancouver or Seattle. 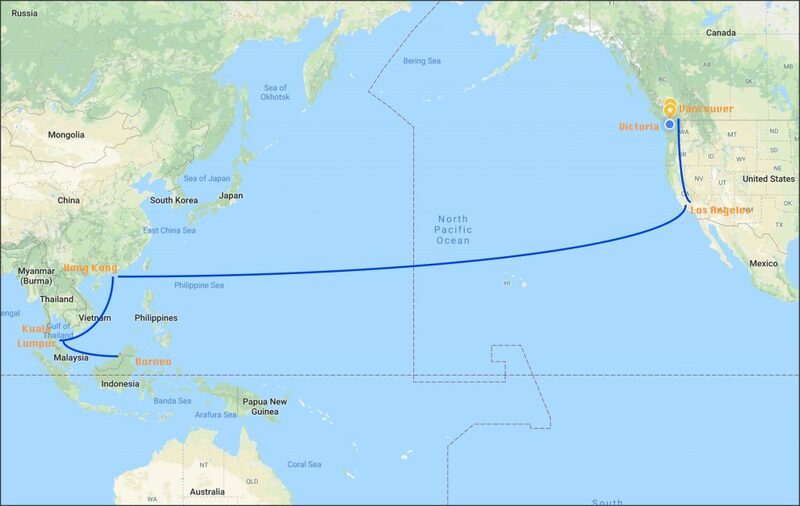 Despite the long flight from Los Angeles to Kuala Lumpur through Hong Kong, I decided for the westward flight to do it all in one go – some 35 hours end-to-end! On the return trip, I overnighted in a Los Angeles airport hotel, giving myself a break from the long flights. After the initial bookings were in place, most of the group opted to upgrade to Cathay Pacific’s Premium Economy, in order to get a reclining and bigger seat, our own cabin, priority boarding, and a choice of meals, snacks and drinks included. On a long flight, these extras can make all the difference. In my case, this was the first time I have ever slept for more than a few minutes on an aircraft. This particular tour was quite expensive, since I had to pay in US$ (paying at 35% premium from my CAD$), a single supplement to ensure I had a room to myself (instead of sharing with a stranger), Cathay Pacific’s Premium Economy surcharge, and connecting flights to and from Los Angeles, including an extra night at an LAX hotel. Since Borneo is such a big island, our group took many local flights when we went from Brunei to Sabah, and onward to Sarawak, as well as longer flights to and from Kuala Lumpur to Borneo itself. Additionally, we used tour coaches and boats to travel to various sanctuaries to see the all-important wildlife and people in sometimes remote areas of Borneo. Although the cost of this tour was higher than I normally spend on travel, the arrangements offered good value because of our unique experiences, mainly thanks to our excellent local guides and drivers. There were a total of 20 people on this tour, so it was a small group of mostly-dedicated photographers. InFocus Travel specializes in photography tours, so more time is given at the sights and when animals are spotted to get the shots we are all after. Timing for good light can make or break capturing good photos, and this is always kept in mind when planning the day. Michele goes on every trip, and ensures local guides know what her group is after. When using boats or small vehicles, seating is generous, so blocked shots due to crowding are avoided or at least minimized. I feel I achieved my goals for capturing the unique wildlife and cultures to be found on Borneo with my photos and video, so the answer is “yes”, it was well worth it!